The Chief Ministers belonging to the Trinamool Congress, CPI(M), TDP and JD(S) had expressed solidarity with their Delhi counterpart Arvind Kejriwal. On the sidelines of the NITI Aayog Governing Council meet, the four Chief ministers met PM Modi. New Delhi: West Bengal Chief Minister Mamata Banerjee said today that Prime Minister Narendra Modi did not give any assurance when she, along with three other Chief Ministers, discussed the political crisis in Delhi with him. 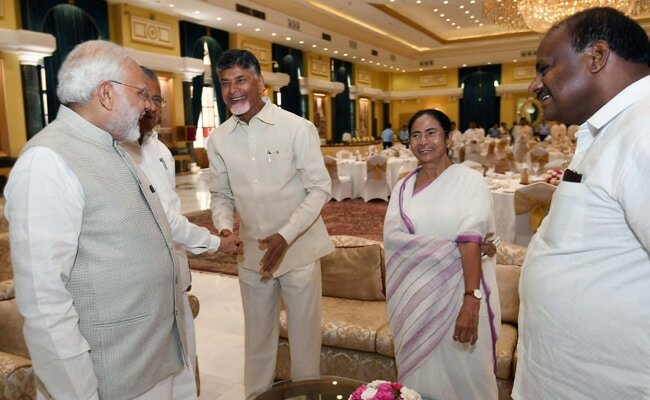 Mamata Banerjee, Kerala's Pinarayi Vijayan, Andhra Pradesh's N Chandrababu Naidu and Karnataka's HD Kumaraswamy had a meeting with Prime Minister Narendra Modi and Home Minister Rajnath Singh on the sidelines of the NITI Aayog Governing Council meeting and urged the Centre to resolve the issue. "We have raised the issue with the prime minister as well as the home minister. We told them that the deadlock should be resolved for the sake of the people. The Prime Minister did not say anything, but Rajnath Singh said that he would look into the matter. We said what we had to, now they have to sort it out. It is their matter now," Ms Banerjee said after the meeting. The Chief Ministers belonging to the Trinamool Congress, CPI(M), TDP and JD(S) had expressed solidarity with their Delhi counterpart Arvind Kejriwal, visiting his home yesterday and seeking PM Modi's intervention on issues over which he has been on a sit-in protest at the Lieutenant Governor's office. Terming the deadlock as "political crisis", the opposition leaders had said that people should not suffer due to any political crisis brought about by any political party. Arvind Kejriwal and his three cabinet colleagues have been staying put in a waiting room at Raj Niwas, protesting against what they call a strike by the bureaucrats in the national capital.